Best Western Muncie est idéalement situé dans le centre de Muncie. Venez découvrir et profiter de notre hôtel à côté des principaux sites touristiques. Réservation au meilleur prix et offres exclusives toute l'année. 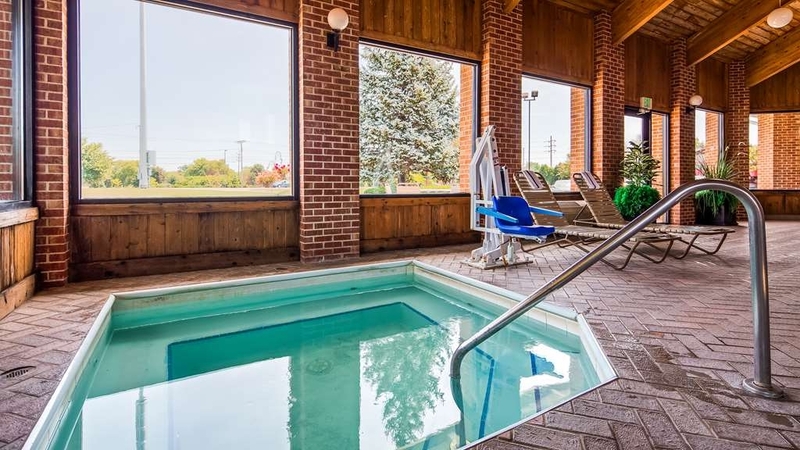 Bienvenue au Best Western Muncie !Vous venez assister à un événement à l'université d'État de Ball ou voir un match au Sports Plex de Muncie ? Séjournez dans cet hôtel de Muncie pour profiter d'un emplacement inégalable. Dans cet hôtel entièrement non-fumeur, vous bénéficierez de tous les conforts de la maison et plus encore. Détendez-vous dans notre piscine intérieure ouverte toute l'année, que vous soyez ici pour une nuit ou pour tout un semestre. Nous sommes situés à proximité de plusieurs restaurants, et nos clients réguliers, qui incluent les étudiants, les professeurs et le personnel de l'université d'État de Ball, se trouvent à quelques minutes à pied de certaines des meilleures recettes de la ville. Le centre commercial de Muncie, où vous pourrez faire de grandes découvertes, est également près de l'établissement. L'hôpital Memorial étant également non loin, nous sommes spécialisés dans l'accueil des médecins en visite, des patients et du personnel de soin. Un hôtel qui vous permet d'accéder aisément et rapidement à l'hôpital est important pour une visite d'ordre médical. Que vous soyez ici pour les affaires ou pour le plaisir, assurez-vous de prendre un peu de temps pour visiter la région. Le centre culturel de Minnetristal est à proximité, et les jardins botaniques d'Oakhurst offrent un paysage fantastique tout au long de l'année. Une visite au Musée national du modélisme aérien est incontournable pour les clients désireux d'apporter une touche culturelle à leur voyage. Vous pouvez aussi acheter des tickets pour assister à l'un des nombreux événements sportifs au Sports Plex, et être sûr de passer un bon moment. Les voyageurs d'affaires avec l'hôpital universitaire IU Health BMH séjournent régulièrement dans cet hôtel de Muncie, qui est installé à proximité du centre des congrès de Muncie-Delaware, où vous pourrez vous rendre aisément pour découvrir des salons et expositions. De Sallie Mae aux entreprises locales, notre personnel accueillant sait à quel point le confort, le calme et l'emplacement sont importants pour les personnes en voyage d'affaires. Réservez dès maintenant un séjour reposant au Best Western Muncie et bénéficiez des meilleurs tarifs ! Chaque client doit présenter une carte de crédit valable ou payer une caution de 200 USD en espèce ou par carte bancaire à l'arrivée. My dad and I came to Muncie to see my alma mater play Ohio. While Ball State did not win, we certainly did by picking this hotel to rest. We both had our own comfortable bed, and the room was clean and kept. Breakfast was better than we expected. Great hotel. Very friendly staff. Good breakfast. Staff in breakfast room very helpful and friendly Clean rooms with comfy beds. Front desk staff provided excellent service. Very helpful staff throughout hotel. Would definitely stay again. I was in town for a family function and stayed 2 nights. The room was clean and the bed was comfortable. The free breakfast both mornings was delicious and had several options. It was quite disappointing to find the pool and the hot tub were both out of order during my stay. Thanks for staying with us! We hope you and the family overall had a good time. I do apologize about the pool being down at the time. Since then we have it up and running. We hope you choose to stay with us again so we can give you an even better experience. Thanks again. We enjoyed our Executive Suite with the Jacuzzi. Overall it was a great experience. We stayed for 2 nights. We are glad that we don't use the pool though as that was closed down for the weekend. Good for us though as our room overlooked the pool area and it could have been noisy had it been up and running. 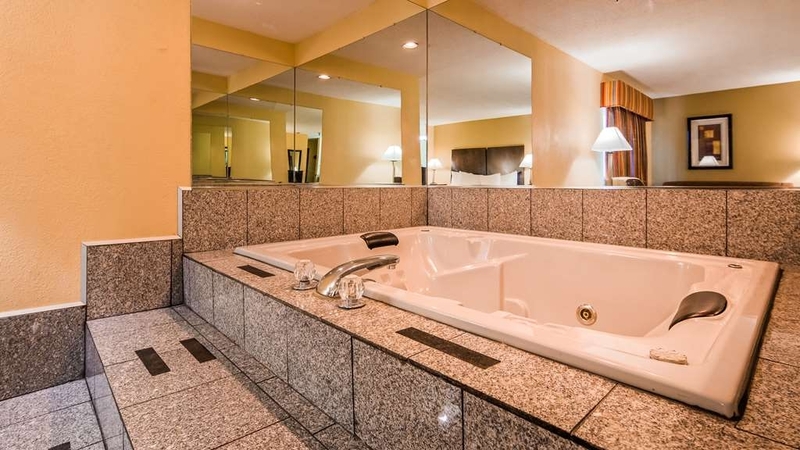 We're glad you had the opportunity to check out one of our Jacuzzi Rooms! We apologize for our pool being down for repairs, we're hoping to get it up soon to provide a nice heated pool experience. We hope you come see us again and thanks for the feedback. I had five rooms for members of my family and heard no complaints from anyone. The rooms were very basic but were clean. The personnel at the front desk were very friendly and quite helpful. The breakfast was quite good with real eggs. The lady running the breakfast room was very sweet and helpful. 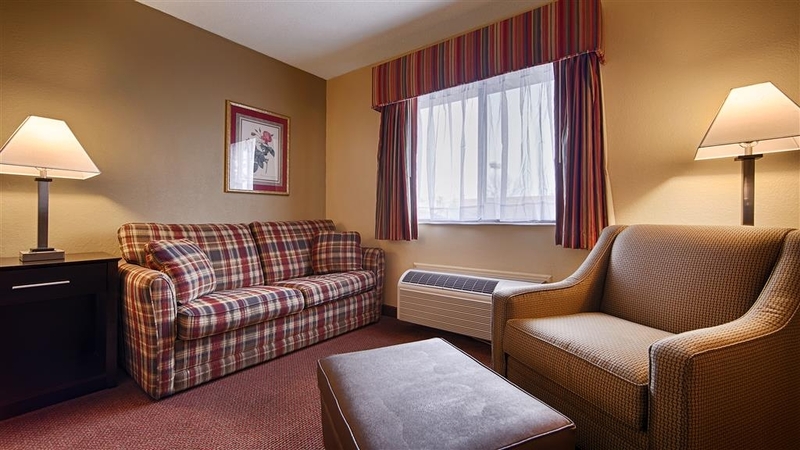 I enjoyed our stay at the Best Western more than I did my stay at the Hampden Inn last year. I would have no problem staying there again. We hope you do choose to stay with us again! We're making a few upgrades that I hope will be ready for you next time! Thanks for choosing us and for your feedback, it is much appreciated! Not a bad place, although there is no guest laundry or gym. The rooms are clean and look nice for the price. Good breakfast and stevia sweetener. Staff is nice. I could tell, however, that despite getting alot of business they are cheap and try to cut corners in some areas. The indoor pool is not heated at all, just cold and unusable. I felt bad for the children I saw swim in it. The side entrances dont lock at all, so may as well consider it an outdoor entrance hotel. After 4 nights (I stayed 5) I wanted my sheets and towels changed but was too late for housekeeping so I requested them to change myself. At this point the clerk was stingy, trying to give me the least amount of towels/sheets possible instead of simply allowing me to replace all of them. First time I have ever experienced this at a hotel. So all in all not the worst hotel but they can certainly improve instead of cutting corners. Thank you for your feedback. I apologize about the inconveniences you may have experienced during your stay. With your feedback we can implement improvements to our hotel. We will address your issues mentioned here. Thanks again for choosing us. 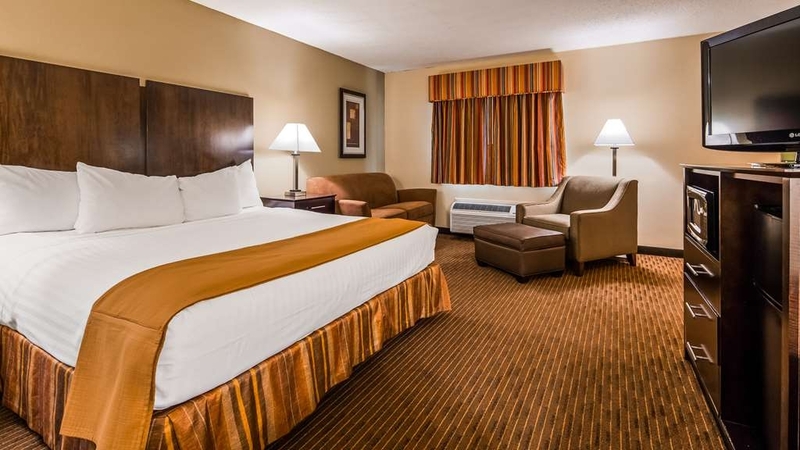 "Great Place to Stay the Night"
Love our stays at Best Western when we're in Muncie! Friendly and helpful staff that go above and beyond to make it the best experience. Perfectly located close to the Ball State campus. Great value! Would highly recommend!!!! "Although 7 Miles From Expressway, Still Worth the Trip"
While travelling through Indiana on the way to Michigan, needed to stop overnight. Decided on Best Western at Muncie. Room was great. Bed was super comfortable. We also had a noisy neighbor. Noise came through the connecting door to the next room. Raising the fan on the air conditioning helped. They have a pool, but we did not use it. Breakfast was very good. Their coffee was excellent, has a feature for stronger brew, which we appreciated. Also had a pancake machine, which you don't see everywhere. We would stay here again. Hotel was very clean, reasonably quite and breakfast was very nice. Only had two real issues. 1 - the bathroom was missing the shower curtain which was taken care of immediately (it had been removed for cleaning and not replaced). 2 - typically in a two bed setup, two queens are usually provided. The room we had only had full sized mattresses. Not a major deal if you are comfortable snuggling and being close to your bed mate. Otherwise, a little limiting for two people. The room smelled like smoke even after 2 treatments. The cleaning people left Taco Bell in our microwave from the guest before us. The jacuzzi tub had issues with staying plugged and some lights were burnt out. Thank you for taking the time to review your stay at our property. We are sincerely sorry about the issues you experienced. We are a non-smoking property and do enforce that with a steep fee. I apologize that we were unable to meet your expectation and we will use the feedback to improve our future stays. Your feedback is greatly appreciated, thank you! We hope to give you a superior experience should you choose to stay with us again. We stayed in this hotel because of my son's visit(s) set up all day on Friday at Ball State University. Ball State is less than 10 min down the road from this hotel. It was close, clean, all basic amenities provided including breakfast. A little noise heard from the room next door but otherwise fine. Staff was friendly and helpful. "So Much For Our Belated Valentine's Day"
So much for our belated Valentine's Day!!! Although the rooms are a little outdated, we chose this place because the whirlpool in the room is nice and roomy (we've stayed here before). Well not this year and I'm not sure if we will be coming back. First we had to wait hours to use the in room whirlpool because they had the water shut off!!! Now the power has been out since 1 am (it's now almost 7 am) our food in the fridge I'm sure he gone bad and again cannot take a shower or use the whirlpool. They have no back up generators. Even the emergency lights aren't lit up!! I think next time we will just go to the Cambria like like usual. The manager is always pleasant so we will see if anything is able to be done. I know they can't control someone hitting a pole but no water for some time after getting there was also irritating. Had this just been a regular room for a regular night it would have been okay. But the whole stay was a disaster. "It is a very nice place to go be at." There is a pool and jacuzzi, but not as warm as we like. Very comfy bed, has WiFi, tv, breakfast, microwave, fridge, all to accommodate. Very nice staff, and always helpful. I have been going there for years, great place to stay. I would like to apologize for the issues you had at your recent stay, we will look into the issues you had. Room was overall clean but found a pair of pants on floor upon entering the room. Hotel cleanliness is huge to me and while room was clean seeing that ruined it. Probably not a common thing but just couldn't get past wondering how well Room was actually cleaned. The hotel and staff were extremely great. Anything we needed they were glad to assist with. They went above and beyond what any expectations were. Anyone looking for a place to stay in this area should choose this place. Very nice hotel. Easy check-in, nice staff. No elevator for 2nd floor rooms. Rooms on first floor were comfortable but noisy at times. Room was spacious but bed mattress was well used and needs replacement. Perfect working desk to do all my paperwork. Refrigerator and microwave worked perfectly and just what I needed. 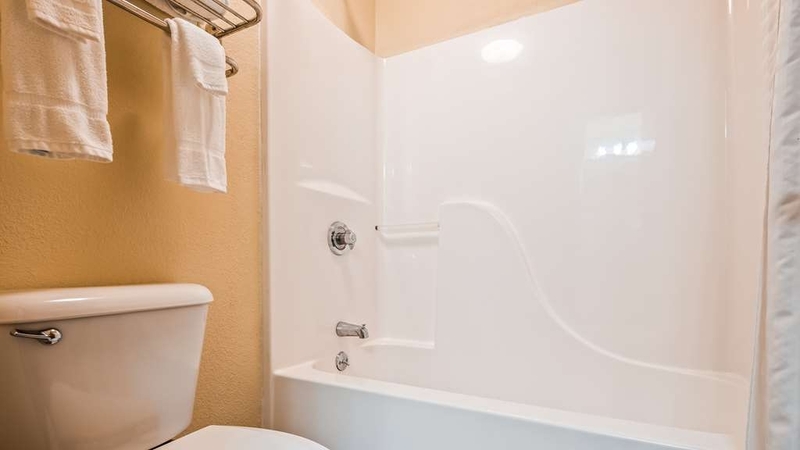 Shower and other amenities we're perfect. I would recommend this hotel to anyone. 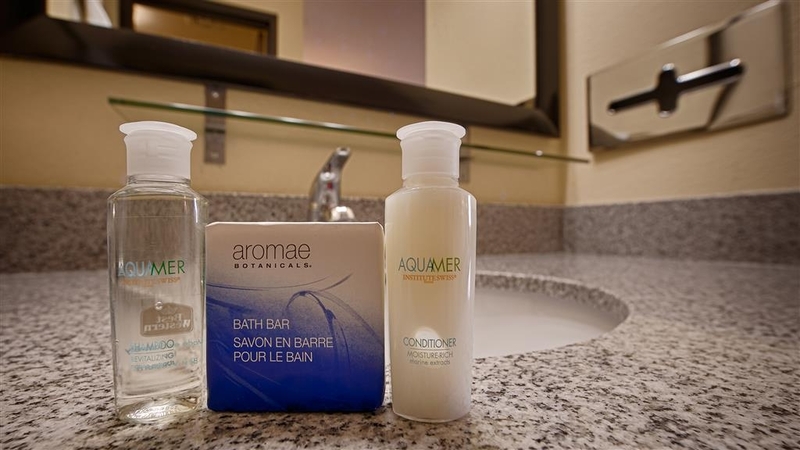 Excellent service and amenities overall! Staff was very nice and informative, the rooms were very clean, the beds were like sleeping on a cloud, and the breakfast was amazing! I recommend staying here for business or pleasure. I really was impressed with this hotel. I had read a very poor review on another site and the management responded so well that I had to check it out. The hotel is small and nicely taken care of. The rooms are clean and the beds are comfortable. They had a nice spread for breakfast and the staff was friendly. I would definitely stay again. It is close to the college campus too which was extra nice! For the price you Pay you get all you would expect and very friendly staff. "Great hotel with Great staff"
Jared and the rest of the staff are wonderful. They are all kind and very helpful. Our group stays here every year for Ball State Homecoming, and we always feel welcome and at home. Even though I wish the price would not have gone up, I don't foresee us staying anywhere else. The staff at this location went above and beyond to make sure our stay was great!!!! They seemed to really care about us as people!!! The front desk person made sure we had a WOW experience and the woman taking care of the breakfast in the morning really cared how the food tasted and wanted to make sure we enjoyed it! So refreshing to see people who take pride in their career! Thanks! Everyone on staff was more than happy to help with anything you asked for. Greeted customers with a smile and genuinely seemed to love their job! The rooms were clean and the pool was well kept! Great place to stay especially for the money!! We stayed for a couple days for a family member passing and left and came back another night for the funeral. Everyone was very supportive and understanding of our needs. Kathy especially made sure my grandkids were well taken care of for breakfast. Jared was very helpful at the front desk. The pool was very nice and relaxing. We will certainly like to stay again next time we are in Indiana. Thank you very much for staying with us, it was our pleasure to have served you. We wish you safe travels and we also hope to see you again down the road. 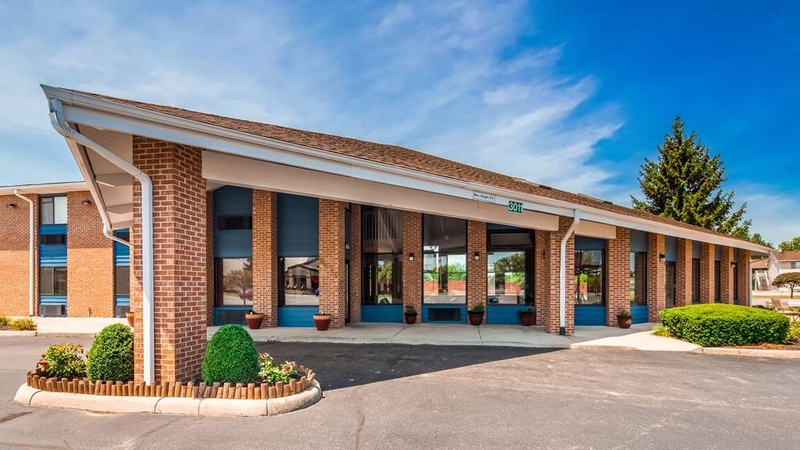 Be well and thanks for choosing the Best Western in Muncie! This hotel is currently being remodeled. The rooms are large and clean! Great location to campus and near plenty of restaurants. The hotel staff seemed friendly and helpful as well. We will for sure stay here again! Thank you for choosing to stay with us! We just finished a recent exterior face-lift so please come by again to see what's new at our property! 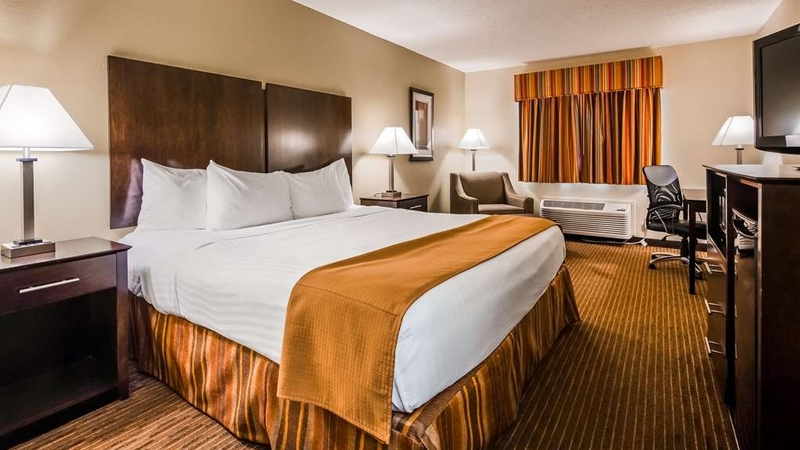 Being the closest hotel in Muncie to Ball State University and having a very central location to the majority of restaurants in the area we hope to accommodate you again. We stayed at this hotel, which is located right next to the Ball State stadium for a last minute event that we attended in Gas City. This was the closest hotel we could get last minute. We arrived late but the outside of the hotel really made me question rather I made a right choice but once you enter the hotel it has been nicely remodeled and looks new and fresh. Our room was very clean with no problems. Breakfast and staff are great. So don't worry by the outside shell the inside is great! "Ball State Family Weekend 2017"
Always stay here when visiting my son at Ball State. Great location, Great staff, Good rooms, Nice pool & good breakfast. Would highly recommend it for families visiting students at Ball State! Already booked rooms for May 2018 graduation! "Friendly, Clean and Good Value"
Stayed 9/20-9/25/17 with wife, family and extended family. Staff is very friendly and helpful. Rooms are clean and beds were comfortable. Nice hot breakfast available each morning and coffee is available all day in the breakfast area. Lots of restaurants and shopping nearby. "Quiet room; very comfortable bed; good breakfast"
The exterior of this facility is showing its age, but still provides Best Western quality in their rooms. Breakfast includes hot items such as scrambled eggs, pancakes, sausage, biscuits and gravy ...very good. If you are looking for good quality, a good night's sleep and don't care about outward appearances, this BW provides a quiet room and very comfortable bed at a very reasonable price. Thank you for choosing to stay with us! We are glad to hear you enjoyed our hot breakfast and had a good night's sleep! We understand that our exterior is starting to show it's age and we're excited to let you know we're going to be doing some exterior renovations in the near future. We hope to share more with you soon. I hope you choose to stay with us again and I also hope we can provide you with a superior experience. Walk in front door to offensive odor. Go to your room and it is worse. Food in kitchen was dried out or over cooked. Kitchen HELP was the opposite, overbearing and interfering even when asked to go away. I don't know how other rate hotel rooms, but the most important to me is a comfortable bed with clean sheets. Great bed. Every bit as good as the more expensive motels down the street. My wife and I also enjoyed the continental breakfast. TV worked, surfaces were free of dust, and the WIFI was easy to use, and at least protected by a password. All in all, we will stay again on our next trip to Muncie. "Not all best westerns are alike"
This hotel did not take any best western coupons i had, the breakfast has very few choices, everyday they have sausage and eggs for the hot food, outside trash cans were over filled, landscape looked ruff and all the planters had dead flowers. I made reservations way in advance for ground level and didnt get that, this place is really going down hill. One of the worst best westerns ive stayed at. There is no elevator, the floor was unlevel, the internet was slow and the beds were hard. The bananas werent fresh at breakfast and the eggs were tasteless. Great pool and spa area though. A nice clean, comfortable room at a very reasonable price. The staff both in the evening and in the morning were very cheerful and helpful. Breakfast featured the standard cereal, muffins, fruits and such. All in all, a very pleasant experience. No complaints here. Bill, thank you very much for your response. I hope everything met your expectations. We look forward to hopefully serving you again! Excellent place to stay. We have stayed here on multiple occasions now. The only thing that would make it better is an elevator. Great service. Great food. Great sleep, very comfortable bed. Great location close to Ball State University. "Great staff at Best Western Muncie"
Awesome stay! employees courteous and eager to help.Breakfast ready early.Coffee ready early Thank Goodness for that right? Pool clean hot tub clean and works very well be prepared lol! Loved it!!!!!! 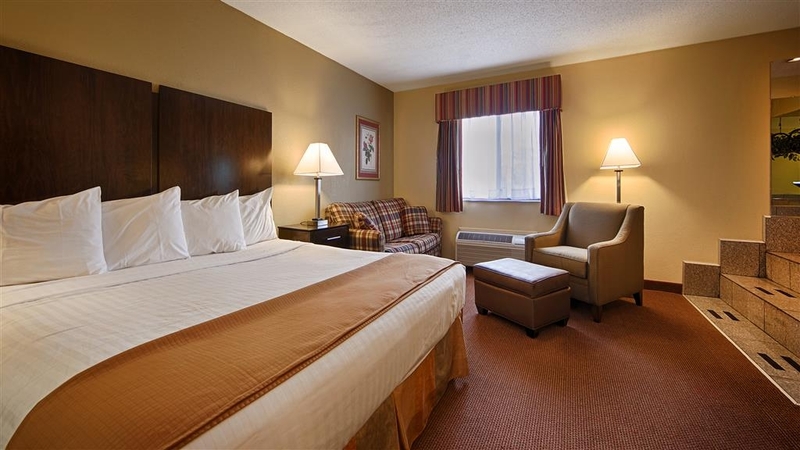 The price was fantastic, the staff was very friendly and helpful and we had a nice room. The breakfast was not the greatest, but it was very good. The pool area looked very clean, though we did not use it. The beds were comfortable and I loved the pillows! The room was clean and a good size. Thank you very much for choosing us! We hope we met your expectations. It was indeed a pleasure having you stay with us. I hope you enjoyed our breakfast and all our amenities during your stay. 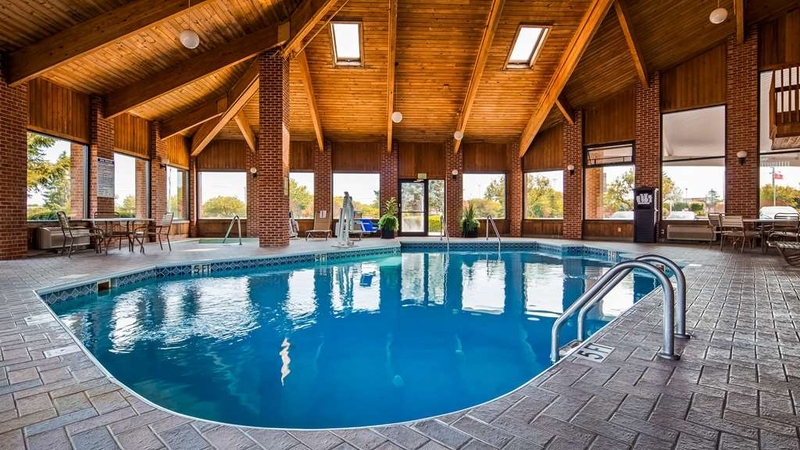 From our freshly-cracked eggs and biscuits and gravy to our indoor pool we are here to provide to your satisfaction. We look forward to serving you again in the future. Thanks again. "Charged my room and I was not at hotel"
I did have plans to go to Muncie and accidently picked the wrong month when making this reservation. Instead of contacting me after missing the first day, they charged me for 5 days worth of stay. The days were later reversed and one day was charged. What really angers me is that an ID and make of car needs to be provided before you can check in. They also did *Quick Check Out* to the room, when I had never been there. I would like to apologize about the issue, no guest was checked into the room it was done as a no show. Our normal procedure is to call someone after first morning. I am sincerely sorry this was not handled to your satisfaction. The front desk people and the maintenance man were very good but the housekeeping was the worst out of all the hotels I have stayed. They couldn't even make the bed properly basically just threw the covers up. They left trash around the trash can after emptying and they didn't replenish coffee or vacuum the rooms well. The location was very good and the neighborhood surrounding the hotel was safe. The pool was the best thing about the hotel. "DON'T STAY HERE BED BUGS!!!" While staying at the hotel my son got many many bed bug bites. I notified the hotel a few hours after check out. The person answering the phone didn't seem concerned but said he would tell manager. I sent an email and another phone call and didn't hear back for two days. I then contacted my visa and stopped payment for the stay. Then after another two days the hotel sent me an email to confirm the amount to refund...nothing in the email regarding the situation just please read and confirm the refund amount. No signature from manager, no info regarding the condition of my son NOTHING! I have sent two more email asking for reimbursement for medical care and medicine. Still nothing !! I will be contacting Head Office and hopefully they will be better. Terrible service, terrible conditions watch out from room 207!! As soon as we received your report we had the room and the surrounding rooms treated both heat treated and chemically treated, we are sorry for the inconvenience and are awaiting your email/call. 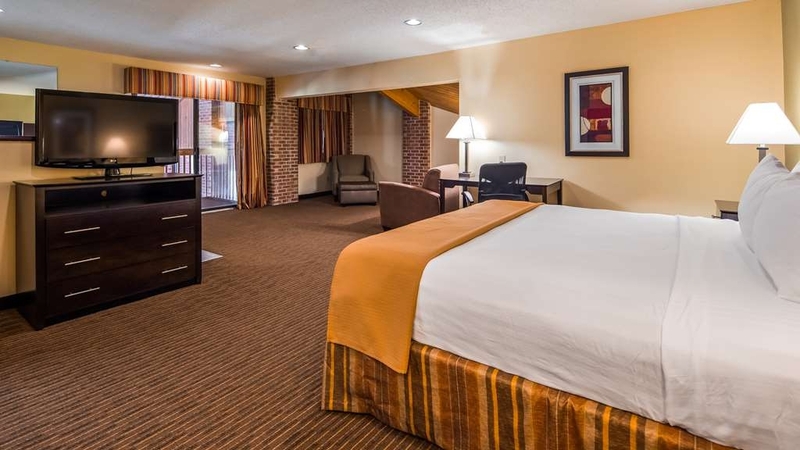 "Nice hotel at a reasonable price"
We began staying at the Best Western in Muncie in 2012 when our daughter enrolled in Ball State University. 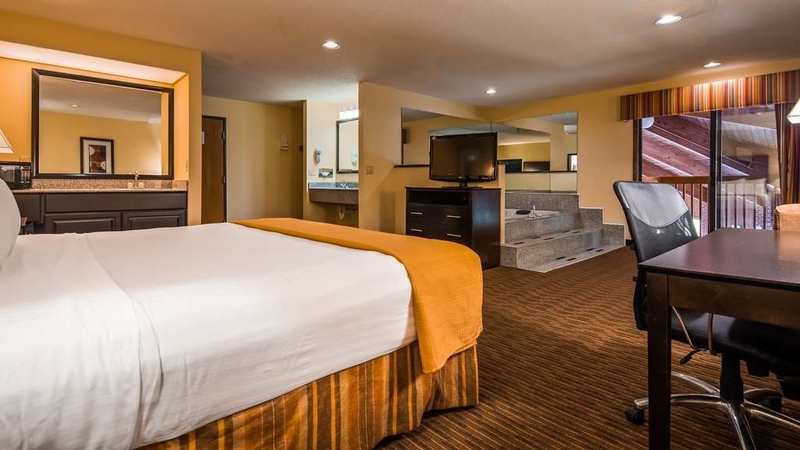 We were impressed with the friendly staff, clean rooms, comfy beds, large pool area, in room amenities, variety complementary breakfast and value for the buck. Not once have we ever had an issue in the 5 years we have been staying here. So we highly recommend this motel to all new BSU parents and travelers. My daughter was at Ball State for 4 years. Driving from Grand Rapids Mi I stayed in MMOST of the hotels in Muncie. I have to say that this hotel is by far the best for value, helpful friendly staff, as well as cleanliness. 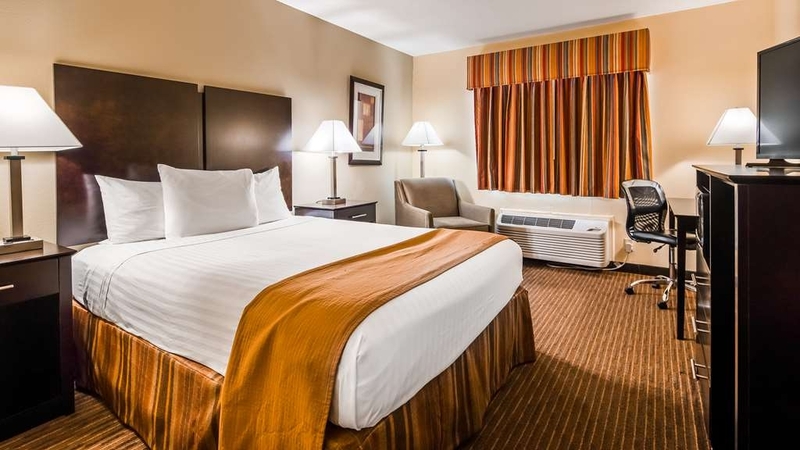 It is not on the road with all the other chain hotels, it is actually closer to campus and easier access. Much quieter location. It has a nice pool and hot tub kept very clean. 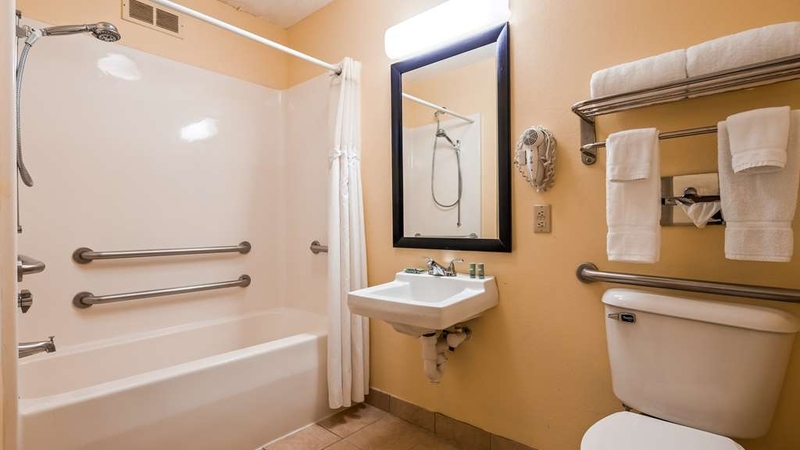 The rooms and bathrooms are clean and spotless. Breakfast has many options, with eggs, sausage, pancakes, fresh fruit, yogurt, fresh donuts from a bakery, oatmeal etc. The rooms are about 30 to 40 percent less than the other chains. This place is ok. The room was big and bed was comfortable. A little outdated. Had nice size refrigerator in room. Bathroom sink outside of bathroom, light shines on bed. Breakfast was hot but not very tasty. The eggs had no taste even with hot sauce. Donuts had as much icing as donut. Coffee was good. Location to ball State was very good. Staff was friendly. So I stay at the Best Western this past Friday. I actual arrived at the hotel about 6:30 in the evening. It was an easy check in. This hotel is walking distance to Ball State. The rooms were ok, clean did have a microwave and refrigerator. The hotel is only 2floors no elevator and the lobby entrance is dark. The pool was okay they did provide towels. The only thing is you definitely have to make sure your room door closes be hide you. There were a couple of times where I walked back into my room and the doors never closed so I had to put it shut . Over all ok for a 1night stay. Nice selection for breakfast. The lady working in the breakfast area was very good at her job. No complaints. Would stay here again. Room was clean. Bed was comfortable. Was close to where we were going. "Great place to lay your head." "Best Western Muncie, Indiana - nay nay stay away"
Found human hair on my shower wall, room had not been dusted in days. The internet connectivity was absolutely terrible. I had to reconnect every 3-5 minutes. I had to go to Starbucks to get my computer work done. "Comfy beds clean , the staff was crowding the breakfast area every morning though getting themselves food." "Great Staff. Shower wasn't working"
When I arrived the staff was friendly and welcoming. The rooms were clean and neat, however, the shower head didn't work and the microwave was beeping the entire time. I switched rooms after having told the desk staff twice. (because they forgot about my request to fix the shower head) Overall, it wasn't terrible and the staff was genuinely helpful and polite. The rooms were very clean and were very nice. Our stay at the Best Western was a very pleasant experience. 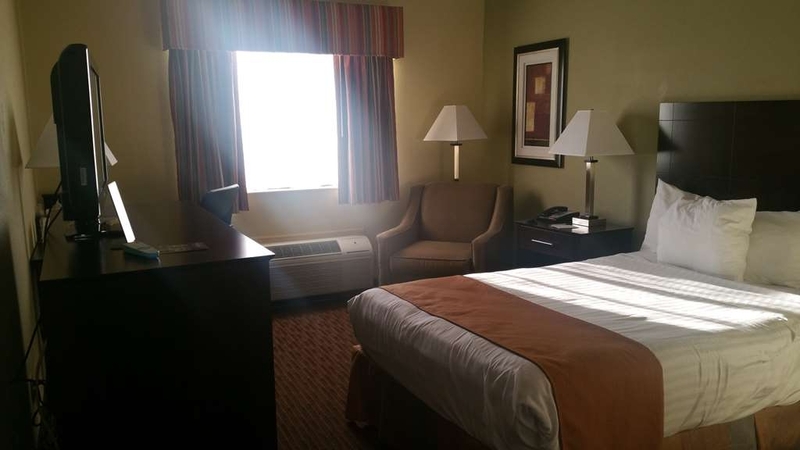 The room was clean, the staff was polite and helpful, and it was very decently priced. I would definitely stay here again and recommend it to anyone looking for a nice hotel at a good price. I thought the hotel was perfectly fine, although the other people staying with me seemed less than impressed. Room was comfortable, clean and well appointed, although could have used a little maintenance. WiFi was very unreliable and slow. Breakfast was standard. Didn't try pool but it looked nice. Service was well-meaning though very informal, to the point of person working the early breakfast shift barefoot and in sweatpants- this bothered others but not me. 5min walk to the free shuttle for Ball State, and 30min walk to the center of campus, but the area is not very pedestrian friendly. "Come to party in a dusty motel." Noise, noise, and more noise. We asked the night clerk to help quiet the guests who were running up and down the halls, but we received no help and the noise continued until after 1:00 am. There was also mold on the shower curtain and dust on all surfaces in the room. We stayed at this hotel to visit out grandson. 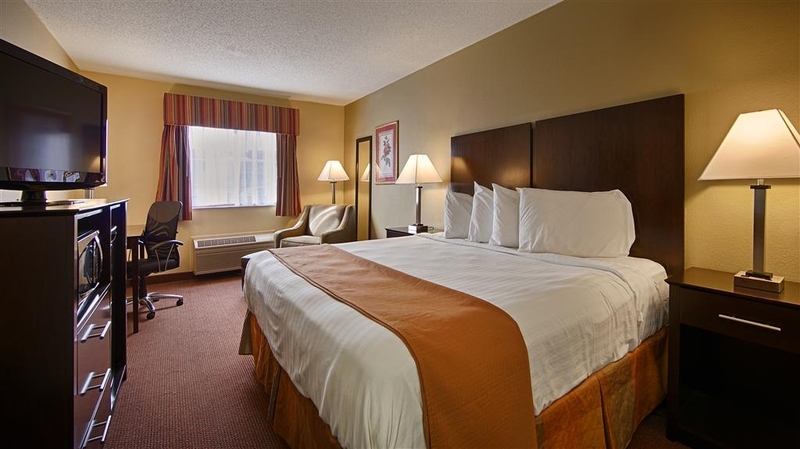 We liked the location of the hotel because it is close to Ball State University. My husband and I could walk to the football games if we so desired. We would stay here again. I planned a get away with m daughter for her fall break. I chose this hotel both for the amenities and for the awesome deal I got. Clean inside and out. comfortable beds. Swimming pool bigger than many other hotel pools. Even though the hotel was located near a busy main thoroughfare thru town you heard no street noise! We stayed on the first floor and unless someone was a very heavy walker you couldn't hear noise from the second floor. Very nice place to stay. I would recommend this hotel to anyone looking to stay in the Muncie area. Visiting with family , room was NOT very clean Nothing special !! Rooms need upgrading! Not a Great experience but not a totally bad one too! Went to pool, BUT even indoors, was too cold wanted to warm up in sauna. BUT WAS EMPTY!! Breakfast buffet left a lot to be desired! Would TOTALLY Choose a different location next time! Nuf said!!! The air conditioner in our room wasn't getting cold. We had it on as cold as it could get for 3 full hours and were still sweating! The guy at the front desk treated us horribly. He was very rude and pretty much told us that we were crazy. We will never stay here again! This is a basic motel. No elevator to the 2nd floor which could be an issue. The staff was pleasant and helpful. The room was small but adequate. Sufficient choices for breakfast and reasonable quality. My bed was fine but the pillows were awful. I was kept up all night with screaming and jumping on the beds from a room of 13 occupants. Only one of which was an adult. Management did little to fix the problem which resulted in no sleep for the night. "college visit for my son nice hotel near the university"
"Nice staff, not so nice facility"
Very close to the Ball State football stadium; decent price. But hotel is not in great shape and bed and bedding were poor. HBO didn't work. Wireless internet was good. Breakfast had good options. Staff was friendly but seemed very overworked. The staff is helpful and my group of 14 rooms had a smooth check in. The hotel is in need of some upgrading such as doors that don't stick. There is an Oder that may be from the cleaning solutions used that is not pleasant. Over all the hotel is priced right for what you get. We were there a week. Thanks to Jared for all the help. 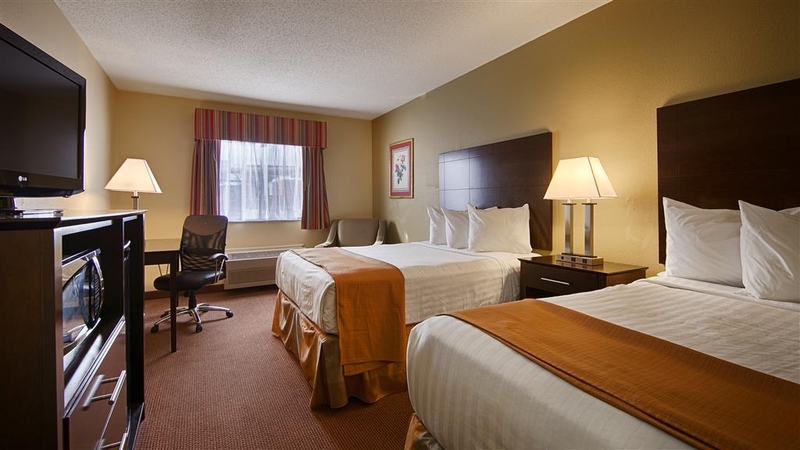 We usually stay at this Best Western when visiting Muncie due to the convenience and cost which is typically much lower than other nearby hotels. The hotel may not appear as fancy as others but offers everything needed including the breakfast. The pool area is excellent. "Moving daughter for Sr. Year." This is the second time we have stayed here at the BW. I have to say after staying across the way with the other major chains for close to $40-$60 more a night.....never again. The staff is super attentive and helpful. The hotel is very clean, hot water,comfy beds, great showers, nice pool and hot tub, and pretty quiet. The breakfast is like most, being Gluten Free I always stick to the yogurt, apples and PB, or oatmeal. But they have eggs, sausage, a pancake maker, as well as cereal, and great coffee... I already reserved rooms for graduation. This is our go to motel now in Muncie. "My stay at the Best Western Muncie!" I was very satisfied with my stay at the Best Western. The room was clean & confortable. The bathroom was very small. If you are coming to Muncie, this hotel is very near the Ball State Campus. I would stay here again. Overall this hotel is a pretty good choice for the money. Be careful of the slippery pool steps, and be prepared to do laundry down the road as there is no guest laundry available. The free breakfast is decent and consistent each day, and the staff are nice to deal with. Location is off the main road through town so expect peaceful evenings with no traffic noise. Also, an excellent Mediterranean restaurant within walking distance to the west-don't miss it! "Pretty nice for a night." Friendly staff asked if they could help in any way. Clean room but had a rather strong odor, which I got used to. Smelled faintly of roses, but seemed to cover for something. The room was spacious with a small toilet/shower area. Thin towels. Very comfortable beds. Full breakfast with eggs & sausage. Eggs were getting overcooked in the warmer. We slept well and feel this is a very good value! Hotel staff was very nice. Hotel was clean but you can tell it's old. Beds were very comfortable and loved the pancake machine. Hot tub water was not hot. Water pressure in shower was great. If you are staying in Muncie to go to Ball State it is 5 min. away. Hotel overall was clean. Breakfast was adequate and provided a few choices. Room was nice and bed was very comfortable! Location is ideal for visiting Ball State University and the Muncie area. We will stay again. "Very Good Ball State Hotel"
I have stayed at this Best Western multiple times over the past 2 years, as my son attends Ball State University. I am always very pleased with my experience, and the Best Western will always be my first choice when I go to Muncie. The location is excellent - the closest one to Ball State and it's right across the street from the tailgate field for football games. The hotel itself is very clean and safe. The rooms are comfortable, with many being updated in their decor. I love having a refrigerator and microwave in my room. They have a very nice breakfast included - nice entrees like biscuits and gravy, not just juice and croissants. There is a very large and nice indoor pool. The best part of the hotel is the manager, Jared. He is very conscientious and remembers frequent visitors. This is obviously not a 5 star hotel, but it's extremely comfortable and an excellent value for the price. I will continue to stay there every time I go to Muncie. It was dirty. I never received a receipt. My children found a hairband in the bed? We're the sheets even changed? There was stains on the bedding. The people at the front desk were miserable and not friendly at all!! Will never stay there again! My sister, nephew, and I spent two nights at the Best Western. The room was clean. The room had a coffee maker, hair dryer, refrigerator, and microwave. The WIFI worked well. We used the pool and hot tub. It took us a while to figure out where to turn on the jets to the hot tub (by the shower). The staff were attentive and helpful. A mother and daughter had car trouble and the staff assisted them in finding a place to get their car fixed. The breakfast was good. Scrambled eggs, sausage, sausage gravy and biscuits, pancakes, cereal and toast plus coffee, juice (Apple and OJ), milk were available. There was others items available as well. Checkout was easy. The hotel was quiet and you had to use your hotel keys to get into the other doors. I would stay again. Although the beds, linens and furnishing are a bit dated and worn - the hotel is clean, has fast wifi, friendly staff, nice pool, and a decent breakfast. Close to a few good restaurants, easy walk to Ball State University football stadium and track. I only stayed a couple nights. But I wouldn't have chosen any other hotel in that area. 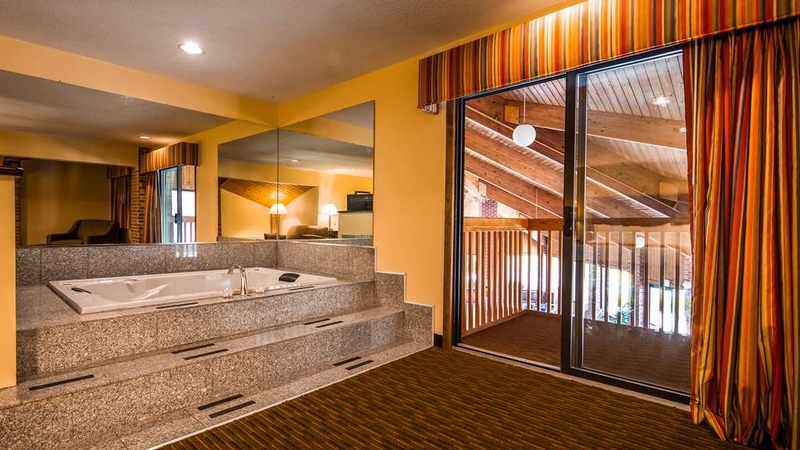 I had a single suite with a superb hot-tub and very clean room. The Hotel is in good shape. The layout of the room was very ascetically pleasing. The price is acceptable. The water quality from the tap is WAY better than some places I've stayed. The amenities are nice as well. To start with the front counter attendant was in the back room, and didn't come out until we hit the doorbell despite being fairly loud talking at the front desk. There was a pool towel hanging on the back of the bathroom door that was left by a previous hotel goer. Housekeeping could have been a bit more attentive, one if the rags had a brown stain on it (who knows what that was). The pillows were uncomfortable and had me tossing and turning all night trying to get a good night sleep, which didn't happen. The coffee maker had some white chunks (possibly lime/calcium) in the reservoir. The breakfast had no coffee creamer or fruit available. I'm not a big breakfast person but I do enjoy a piece of fruit or two occasionally in the morning. All in all, not bad if you just need some place to lay down, but don't expect anything special. The manager, Mr. Chandra Kollipara is a very courteous and helpful gentleman. The rooms are very clean and well attended. The support staff is also very helpful and friendly. This is the second time that we have stayed there, and will book our rooms there in the future. Had enough points for a free night. Hotel was off the main beat, quiet. Used the hot tub, continental breakfast was good. Rooms are a little smaller, but very nice. Had a fridge, microwave etc. We will probably be using this hotel again. Staff very friendly. 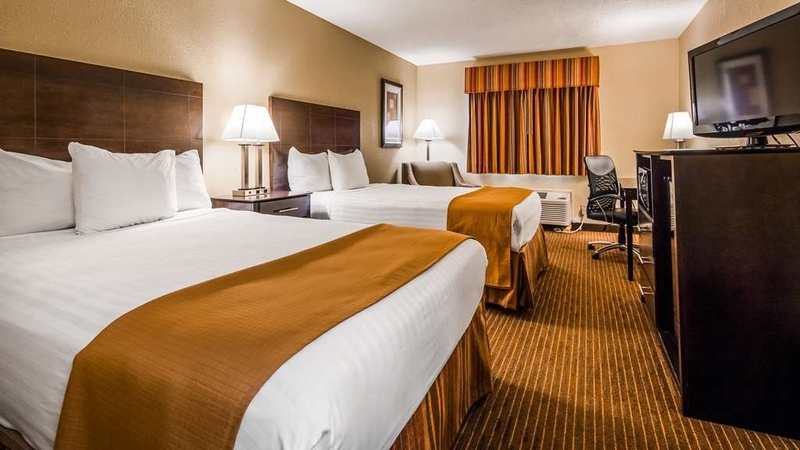 "Convenient to Ball State Stadium"
The hotel is in easy walking distance to the stadium and the staff are friendly. Sadly, the hotel really needs updating in several areas such as the mattresses and the bathrooms. However, the whirlpool is amazingly hot with great jets. Was not happy with our stay at this hotel. The hallway smelled bad and our room smelled like someone smoked in their for years even though I had to initial agreeing that this was a smoke-free hotel. Breakfast the next day was not much better. The eggs were instant and didn't taste good. There was not much of a variety of food to choice from. The only good thing is that we only stayed one night. "I'd pass on this hotel next time"
I was not happy with this Best Western location and will not stay there again. My room did not smell or seem clean. It did not look like it had been vacuumed. That coupled with a hard bed, scratchy sheets and outlets that didn't work made for an unpleasant stay. I'll choose another hotel next time when in Muncie. "Mom's Weekend at Ball State"
Worked out perfectly for Mom's Day at my son's fraternity! Love staying here. Super close to Ball State and stay here whenever we are in Muncie to visit our son. Will be back again in September for family weekend where we will have additional family members with us! My group of 34 rooms came into the hotel after an all night drive from the east coast. The rooms were all ready and breakfast was on when we arrived at 6:30am. There were no real issues with the check in. The rooms were comfortable and I received no complaints from my group about any cleanliness issues. The only problem was the room keys would not operate correctly. A good number were having to get their keys rekeyed. Not much in the area if you ate walking, so that is a drawback, but not the hotel's fault. The staff was accommodating and helpful at all times. Plenty of parking. We'll probably use this hotel again. 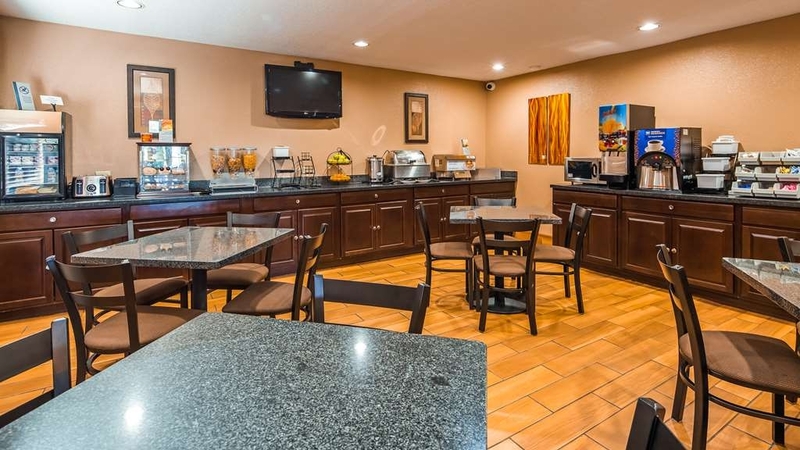 We love staying at the Best Western in Muncie, they are very helpful, clean, great breakfast. We have stayed here several times and will continue to come back. Its a great place to stay if you are visiting Muncie and it's right by the campus. The tap water was cloudy in the bathroom then settled after a while to clear, tasted fine, bed was a little uncomfortable but was tolerable, breakfast was unsatisfactory if you like to eat healthy. Had a fridge, great high-speed internet, and plenty of space for two. Cleanliness was very good. I would recommend this hotel if on a budget, or wanting to save some money. Does the job if you're only in town for a couple nights. We enjoyed out stay in Muncie, IN. This Best Western was quite, clean and safe. It was across the street from Ball State University and close to downtown where my husband was playing in a APA Pool Tournament at the Convention Center. friendly staff nice breakfast. the only issue was the hallways were cold. The pool and spa were nice and clean. Suggest to have towels in the pool, we had to go to the desk to get some. price was very affordable considering the amenities it was a good value. the people made me feel at home. the pool and spa went down but the clerk made it right. we had a really good time and will be there again the next time we are in Muncie. the hotel is really close to the ball state, and almost across the street for the stadium. We only stayed overnight and it was fine for that purpose considering the price. I accidentally left my cell phone at the counter when I checked in. The front desk promptly brought it up to my room before I even realized it was missing. this hotel has a nice jaccuzzi room but the heat did not work in the room they are remodeling and all heat upstairs was off room was 45 Degrees and never about 60 . hotel was not secure did not have a real safe feeling as all rooms upstairs were open and entry outside was broken so did not need key card to enter. room was not ready when we arrived had to wait til 4pm to get in room. "Great value and very nice! " Got an unbelievable low rate for my night stay. Hotel was very clean! Nice shower, very good breakfast! Didn't use the pool but saw several people using it and it looked nice! Nice fridge in the room. Very quiet at night. Bed was a little too firm for my liking. Will stay here again! A forced experience became a pleasurable one. This was not our choice in hotel, but the hotels in Marion were full for my graduation. We were worried when driving through a rough looking area, but our fears calmed when approaching a nice looking building. All of our expectations were met except for a request for more towels. We were only given 2 extra towels for a family of 5. We muddled through the towel experience however and everything else was as nice or better than our expectations. Drove my daughter back to school,as i live over 3 hrs away i chose to spend the night. This is the first time I stayed at Best Western Muncie. Was average room ,priced higher than should beas Ball St was still on winter break. My daughter attends ind. academy-the high school.The loud bathroom fan kicking on when using bathroom during night, was rather annoying. OK for overnight. We stayed 3 nights, the staff is super, breakfast bar fair. 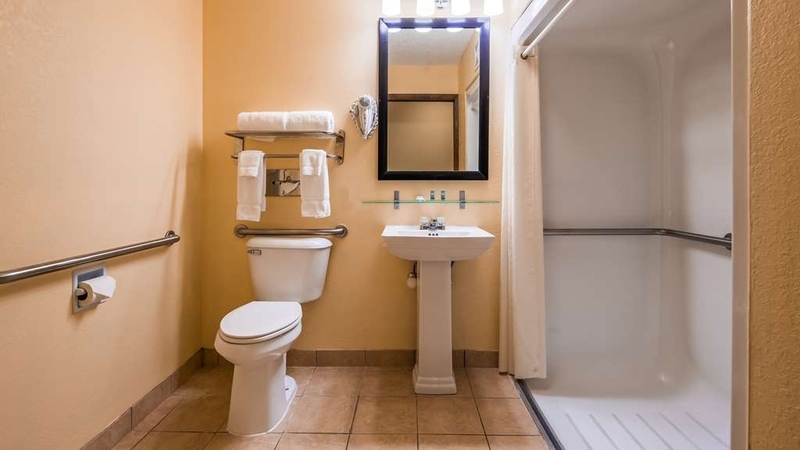 For a family traveling on a budget this is a good buy, and our room was small but Clean. We were in town for a graduation ceremony at Ball State. We were impressed that the rates were not elevated for that weekend, as most of the other places we checked out to stay at for this event. I am disappointed that the hotel's rates were quoted higher when we called directly. 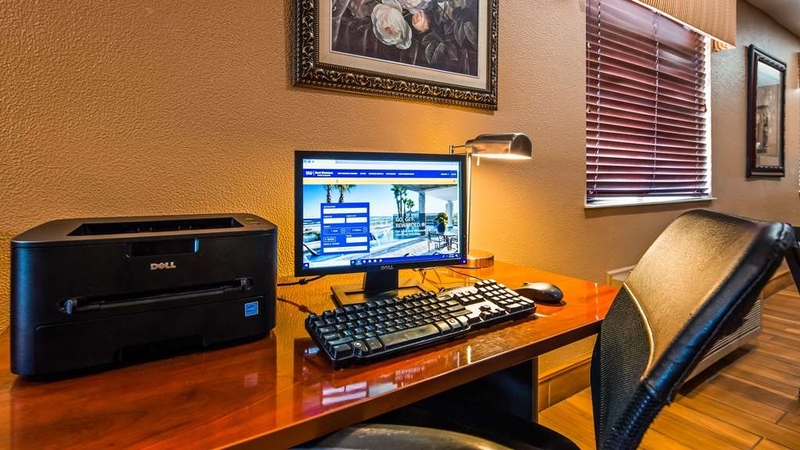 We used hotels.com & got a much better price, then of course Best Western would not give us the reward points because we didn't book with them directly. I do believe this is unfair, but most of the reward clubs do this I hear. This hotel has a friendly staff, clean and comfortable rooms, an excellent pool, and its location couldnt be better. The rates are very competitive and the value for your money is good. We have stayed here numerous times and the kids love it. Thanks!! 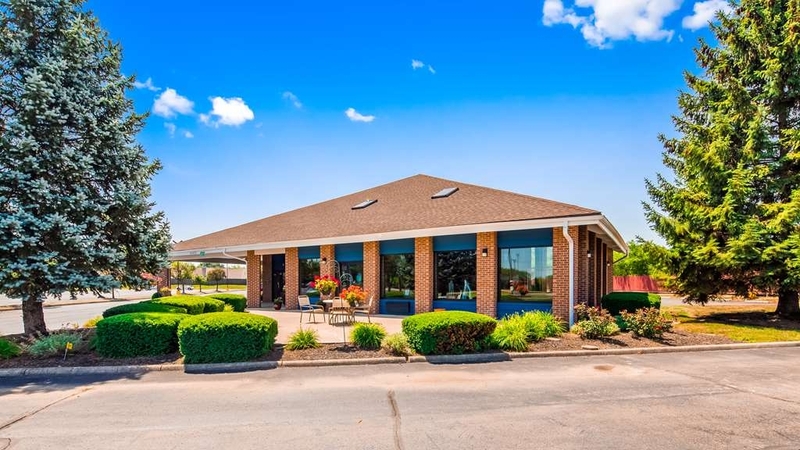 The staff at this Location was Amazing and very accommodating and very nice, I have stayed there three times before and I will stay there every time I go to Muncie. The pool was very warm 85 degrees and the water was very clean. "Friendly Staff after a long Drive"
I had made reservations for the wrong night, but luckily the gentleman at the front desk was able to shift my reservation for the correct night and keep basically the same rate. I appreciated the friendliness and sense of humor he and the other employee had as well. This place has always been our go to if we go to Muncie. We have been to other hotels in the are in the past but nothing compares to BW... As of right now they are in the middle of remodel but from what has been done to the place looks great! 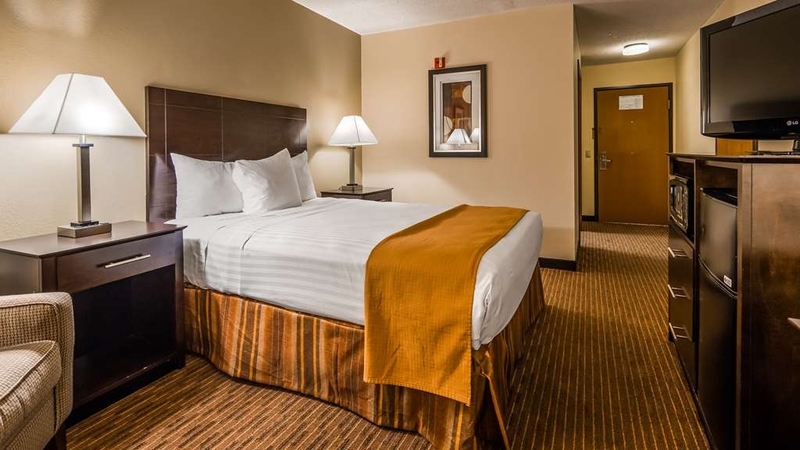 "good location and clean and updated rooms"
The hotel is under remodelling and were putting new carpets. rooms are clean and updated with nice furnishings. The only issue is with the professionalism at the front desk. I checked in on Sunday evening and the desk clerk says good morning it sounded funny and was sitting and chatting with a girl in the breakfast area and when i was back to get some directions for restaurants he sounded as if i interupted their conversation and hurriedly gave me some info about eating places. It is a nice hotel location for ball state and would surely help if THEY HAVE PROFESSIONAL STAFF LIKE MOST BEST WESTERNS HAVE. "Best Hotel for Tailgating at Ball State"
Can't beat the location if you are going to a Ball State football game. Just across the street from the stadium. Nice indoor pool. The only thing it was missing was a fitness room. I rated the room and sleep quality just average because I was in a handicap room. So the bed was very low to the floor and the tub/shower was meant for a handicap person. 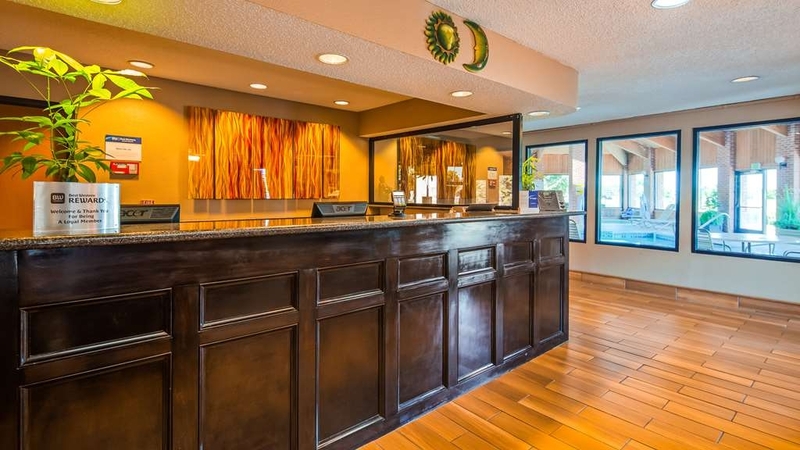 The front desk personnel and the housekeeping staff were very helpful and friendly. Visited my son at Ball State for a football weekend. The hotel was conveniently located across from the stadium. The staff was friendly. The breakfast area was a bit crowded, as it was family weekend, but the food was pretty good. The value of the hotel was excellent. This property was fine and had everything I needed, and I had no problems. However, it wasn't as new or nice as some newer properties in the same price range. Two college football games nearby might have caused the price to be higher than normal. I had a hard time finding a vacancy in the area due to the games, and this hotel met my needs with no problems. The staff was very nice and helpful. 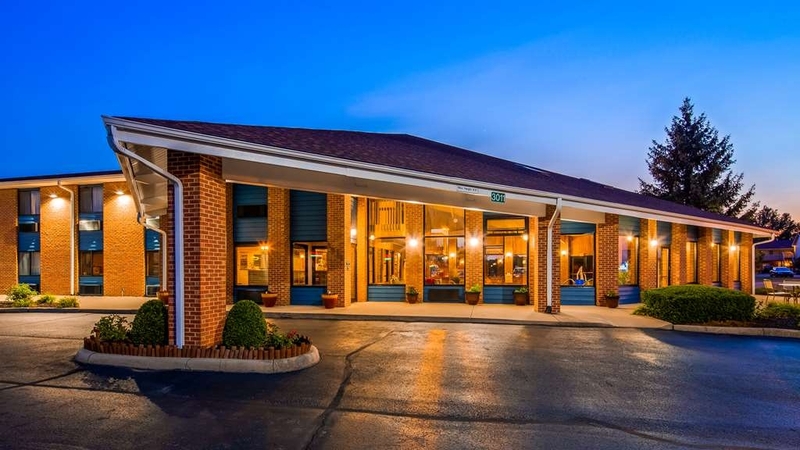 Best Western Hotel in Muncie, IN is a great place to stay. We checked in at night, the front desk guy was excellent, bed was comfortable, the full hot breakfast was great and the hotel was clean. I met the manager that morning and he was awesome. Although I arrived around 10:00pm the front desk person was as if he was really happy to service me and that made me feel real good, like I was very important, many hotels do not make you feel that way. "Family Weekend - Ball State"
This hotel is right up there with the other great quality hotels. It has wonderful proximity to Ball State Campus. The staff is extremely helpful, the rooms are clean and well decorated. Would recommend to anyone visiting Ball State or Muncie, IN to give it a try. Took my daughter on a college visit to Ball State and spent the night here so we weren't rushed. There was a bug in the shower and the room looked like it hadn't been cleaned in months. Dust everywhere. Because the fitted sheets didn't fit, they came off and half the night I slept on the mattress itself. In the morning I woke up only to see that the mattress that I had slept on all night looked like someone had been murdered on. This is disgusting. Either they never change the sheets to see this or they obviously don't care. When I told the manager he seemed indifferent and gave me a $8 discount. WOW. DONT STAY HERE. One gets the sense that they are trying to go the extra mile to maintain something more than just the run of the mill roadside motel. The eggs for breakfast were real and not the instant kind. The front desk was extra helpful with check out and faxes. Clean and comfortable. "Incompetent staff Sept 24 2nd shift and GM"
Rooms clean. Water runs. I come for the indoor spa. Priced okay (I'm cheap). WARNING: One time someone hacked the bluetooth on my laptop while recharging. Always disable and turn off your bluetooth when traveling. They hacked it even while passworded. This is NOT the fault of the hotel, but happened while staying there. No way to trace the hacker. :-( Just a word of warning. But as for the hotel, VERY nice! This is the third time I've stayed and I've liked the presentation each stay I will be coming back. Good, clean value for the money. Has hot breakfast with real food - not just pastries. Nice pool. And no smoking, no pets allowed. Refrigerator and microwave in each room. I am not a fan of the small pillows. Had a nice size flat screen television. Internet service. Was ok. Day manager wasn't very helpful in trying to get accommodations on first floor for a post back surgery patient, and made him walk stairs to second floor. He stated they were completely booked. There were 8 cars in total in the lot. He was clearly just upset that we came earlier than 3pm, (We had driven from Chicago, and not sure how traffic would be) and had to make him work. Shower was leaking from coupling, and was just a mist. Room was straightened, but not sure if completely cleaned. Dust ruffle was torn in several places. Find another hotel. Dirty and outdated. The sheets are old, the towels are old and worn. The mattresses are old. The carpets are dirty. Just not a nice place. I've stayed in Best Westerns before, and although they are not luxurious, they have have always been clean and fairly decent places to stay. Not this one. Security and safety were my issues with this motel. The doors handles on the exit doors upstairs were loose. The back exit door was not locked, even at 2 am. Otherwise, the room was fine, the décor very nice, comfy beds, quiet rooms, clean bathroom, TV was ok. Price was excellent for the type of room and the inclusion of a terrific breakfast. Stayed 3 nights. Pleasant staff. Comfortable and clean room. Nice breakfast. Read earlier reviews and was little skeptical but there appears to be a good baseline at this time. Some flow improvements can be helpful but overall a good trip. I was greeted well. Room was already open. I had to switch on the refrigerator which could be standard.